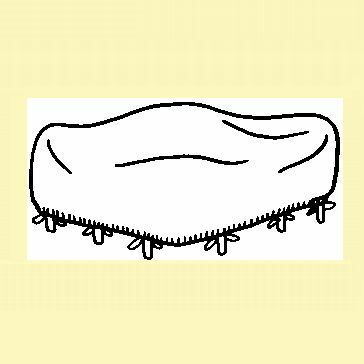 This Deluxe Protective Cover will fit an Oval Table and Chairs. This Cover includes Velcro Closures, Ties, and an Umbrella Hole. Deluxe Shadow Grey Reinforced Cloth-Backed Vinyl Outdoor Furniture Covers have been the market leaders for over 10 years. Heavy duty fabric covers keeps barbeques, patio furniture, and outdoor accessories clean, dry, and ready to use. The durable, heavy duty vinyl won�t crack in cold weather; it resists the elements while the protective cloth backing maintains a soft touch next to your outdoor furniture and other outdoor equipment. This "must-have" line of covers is offered in 60 different sizes and styles, ranging from chair covers to full set covers, chaise lounge covers, grill and umbrella covers, and covers for oversized wicker seating. We can cover virtually every piece of outdoor patio furniture and equipment made.